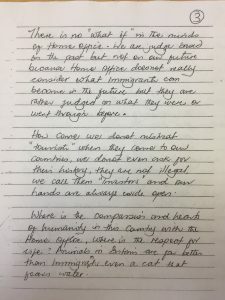 This letter was sent to the Duncan Lewis Public Law team by Theresa (not her real name), a young mother, from Yarl’s Wood Immigration Removal Centre. It was originally published by No Walls. Theresa was one of the leaders of the high-profile hunger-strikes earlier this year. 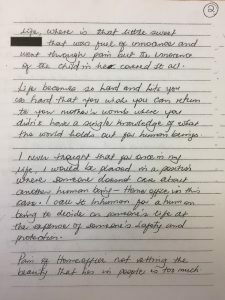 She wrote this letter the same evening that she had been refused bail. You can see the hand-written letter itself below. Theresa has since been released. What can I say right now, I feel terrible, frustrated, angry, bitter, I just want to scream so loud maybe I’ll feel better. 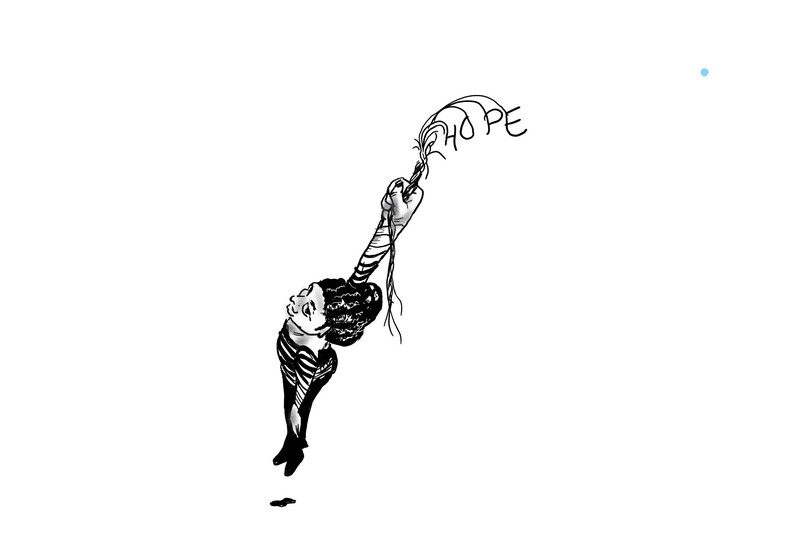 I am hanging onto a thread of hope, if it was not for God today, I could choose to die, end my life and know that life is indeed meaningless. 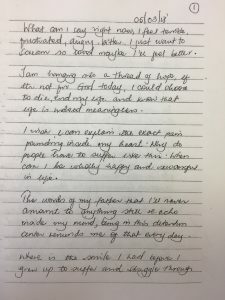 I wish I can explain the exact pain pounding inside my heart. Why do people have to suffer like this? When can I be wholly happy and successful in life. 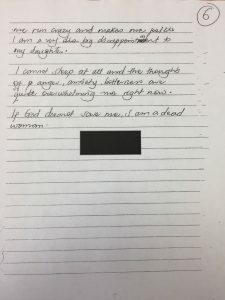 The words of my father that I’ll never amount to anything still re-echo inside my mind, being in this detention centre reminds me of that every day. Where is the smile I had before I grew up to suffer and struggle through life, where is that little sweet Theresa that was full of innocence and went through pain but the innocence of the child in her covered it all. Life becomes so hard and hits you so hard that you wish you can return to your mother in the womb where you didn’t have a single knowledge of what the world holds out for human beings. 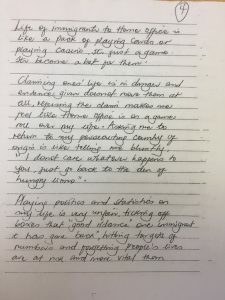 I never thought that for once in my life, I would be placed in a position where someone doesn’t care about another human being – Home Office in this case. I call it inhuman for a human being to decide on someone’s life at the expense of someone’s safety and protection. Pain of Home Office not vetting the beauty that lies in people is too much. There is no “what if” in the minds of the Home Office. We are judged based on the past but not on our future because the Home Office does not really consider what immigrants can become in the future but they are rather judged on what they were or went through before. How come we don’t mistreat “tourists” when they come to our countries, we do not even ask for their history, they are not illegal, we call them “investors” and our hands are always wide open. Where is the compassion and hearts of humanity in this country with the Home Office, where is the respect for life? Animals in Britain are far better than immigrants, even a cat that fears water. Life of immigrants to the Home Office is like a pack of playing cards or playing casino, it’s just a game, it’s become a bet for them. Playing politics and statistics on my life is very unfair, ticking off boxes that “good riddance, one immigrant has gone back”, hitting targets of numbers and forgetting people’s lives are at risk and more vital than even a tablet of paracetamol is more human, is a Godly thing to do. 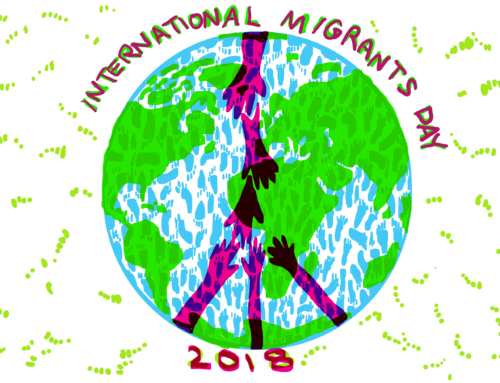 Our lives matter a lot more than the target of a caseworker has saying NO to a persecuted frightened immigrant or asylum-seeker. Our lives matter more than the Brexit or political targets of reducing the number of asylum-seekers or immigrants that are in the country. 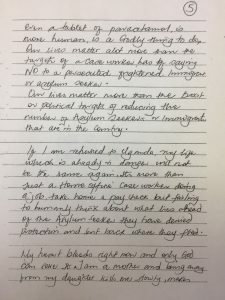 If I am returned to Uganda, my life which is already in danger will not be the same again, it’s more than just a Home Office caseworker doing a job, take home a pay check but failing to humanly think about what lies ahead of the asylum-seeker they have denied protection and sent back where they fled. My heart bleeds right now and only God can save it. I am a mother and being away from my daughter kills me slowly, makes me run crazy and makes me feel like I am a very big disappointment to my daughter. I cannot sleep at all and the thoughts of anger, anxiety, bitterness are quite overwhelming me right now. If God doesn’t save me, I am a dead woman.